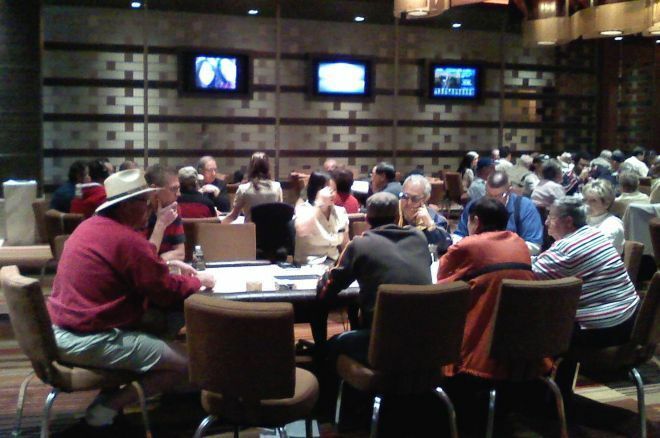 Ashley Adams shares five considerations when playing in a newly opened, brand new poker room. New poker rooms often attract players who are brand new to live poker. Learn how to take advantage. In my last article I covered "7 Things to Look for When Visiting a New Poker Room," focusing specifically on what you should be looking for when you are new to the poker room. Today I want to continue the discussion by looking at five other considerations you should make when visiting a brand new poker room — that is, one that has just opened and is new to everyone. New rooms attract players who have never played in a public poker room. They've played in home games, and maybe they win in those games and therefore think it will be fun to explore the new casino. Such players will typically (though not always) be extremely bad, usually not understanding the more selective and more aggressive ways of serious poker players. To find these bad players, you'll have to look around. Sometimes when a room first opens, brand new players to public poker rooms don't enter the very lowest games, but any games that are available, not appreciating the distinctions between $1/$2, $1/$3, $2/$5, and $5/$10 no-limit hold'em games (for example). While the very best players, looking to take advantage of new players, will probably gravitate to the biggest games, so, too, might some very bad and potentially deep-pocketed players. Look for them. Playing with bad players, especially if you find them in games of higher stakes than your normal level of play, may well result in your experiencing bigger swings than usual. That's because you'll want to be in more pots against them. They'll play in more hands, having the loose habits of home game players, and you'll want to take advantage of their bad loose play. So you'll be in more, enduring the greater swings that this style of play requires. Expect this and prepare for it with a larger bankroll at risk than you might normally play. The tight-aggressive style that pushed the tight timid regulars around may not be best suited for a table with many players who don't even know enough to fold very often. If your game is filled with players who think they can play with the same huge range of starting hands that they play with at home, you're better off with a more straightforward strategy of value betting with a broad range and taking advantage of their too loose play. Your play on latter streets will also have to adjust for their tendency to call you down with sub-par hands. Don't expect to fool them with the tricky plays you've perfected against players who know enough to be outplayed. Poker rooms tend to homogenize over time. Bad players tend to leave or smarten up and get better, while the very best players may move on to other new rooms or back to their regular haunts as the games get tougher. While the truly bad player occasionally graces every poker room, it's unusual for a long established rooms to have big clumps of them at any one time (unless you're lucky enough to hit a room when there's a bachelor party in town). So while there's always some variety in the equality of the games in a typical room, it's not nearly as pronounced as it is in a new room where tables can be vastly different in quality. In a brand new poker room, one table filled with decent regulars may be right next to one filled with first-time casino players. This puts a premium on the skills of sizing up a good table and quickly figuring out where at the table you want to sit. To take advantage of this you need to be especially attentive to moving around to the best table and the best seat at that table. So take some time to figure out where to park yourself. You may be a well known player in your regular room, playing as you do with guys and gals whom you've played with dozens of times. Your image in their mind is probably a fairly accurate reflection of your actual playing style. For example, if you tend to be wild and aggressive, chances are that they know it and respond accordingly to you when you're in a hand together. But in this room — a new room with many bad first-time players — you are an unknown. You will be judged not on your "true" nature but on the one you project in the first few minutes of your initial encounter with them. Since they are unlikely to be very sophisticated, they will tend to read a whole lot into your superficial trappings, even if they are contrary to your long-established playing style. Armed with that knowledge you should be able to better exploit your opponent who only knows you as the player you initially appear to be. I have one final "big picture" consideration to add that is related to that last point. Remember that you only have one opportunity to leave a first impression. Be kind, warm, and gentle with these newbies. To the extent you can, treat the game as something that is fun and playful, not serious and competitive. While you want to take their money, of course, you don't want to leave them feeling belittled, insulted, or demeaned. Whatever you do to these players who are new to casino poker, do it nicely so they'll be inclined to come back and lose more money to you (and the rest of us) in the future! What Kind of Poker Player Are You, Anyway?